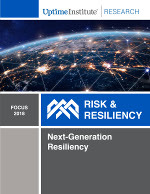 Abstract - The need for resiliency and the way it is achieved at both the data center and application levels is expected to change significantly as the IT world gradually moves to a more cloud-based, hybrid and distributed architecture. Advances in hybrid and cloud computing, containers and virtualization, DevOps, replication, distributed databases and global traffic management (GTM) are coinciding with huge investments in data center and network capacity, and a move toward greater use of software to intelligently manage workloads, traffic and resiliency. All of these are combining to create an architectural shift: from single-site vertical resiliency to distributed, replicated resiliency.